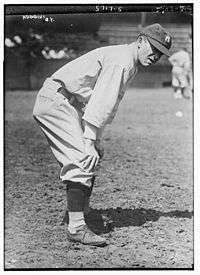 Miller James Huggins (March 27, 1878 – September 25, 1929) was an American professional baseball player and manager. Huggins played second base for the Cincinnati Reds (1904–1909) and St. Louis Cardinals (1910–1916). He managed the Cardinals (1913–1917) and New York Yankees (1918–1929), including the Murderers' Row teams of the 1920s that won six American League (AL) pennants and three World Series championships. Huggins was born in Cincinnati. He received a degree in law from the University of Cincinnati, where he was also captain on the baseball team. Rather than serve as a lawyer, Huggins chose to pursue a professional baseball career. He played semi-professional and minor league baseball from 1898 through 1903, at which time he signed with the Reds. As a player, Huggins was adept at getting on base. He was also an excellent fielding second baseman, earning the nicknames "Rabbit", "Little Everywhere", and "Mighty Mite" for his defensive prowess and was later considered an intelligent manager who understood the fundamentals of the game. Despite fielding successful teams for the Yankees in the 1920s, he continued to make personnel changes in order to maintain his teams' superiority in the AL. He was elected to the National Baseball Hall of Fame by the Veterans Committee in 1964. Huggins was born in Cincinnati, where his father, an Englishman, worked as a grocer. His mother was a native of Cincinnati. He had two brothers and one sister. "You can become a pleader or a player, not both. Try baseball. You seem to like it better." Huggins attended Woodward High School, Walnut Hills High School, and later the University of Cincinnati., where he studied law and played college baseball for the Cincinnati Bearcats baseball team. A shortstop, he was named team captain of the Bearcats in 1900. Seeing him consumed with baseball, his law professors summoned him to justify why they should keep him in the law program. Huggins' father, a devout Methodist, objected to his son playing baseball on Sundays. But Huggins played semi-professional baseball in 1898 for the Cincinnati Shamrocks, a team organized by Julius Fleischmann, where he played under the pseudonym "Proctor" due to his father's opposition and his amateur status. In 1900, he played for Fleischmann's semiprofessional team based in the Catskill Mountains, the Mountain Tourists, leading the team with a .400 batting average. After receiving his law degree from Cincinnati, Huggins realized that he could make even more money playing baseball, and as such William Howard Taft, one of Huggins' law professors, advised him to play baseball. He was admitted to the bar, but never practiced law. Huggins began his playing career in minor league baseball with the Mansfield Haymakers of the Class B Interstate League in 1899. He continued his minor league apprenticeship with the St. Paul Saints of the American Association from 1901 through 1903. After starting his career as an exclusively right-handed hitter, he began to bat from the left side in 1902 in response to his offensive struggles in the 1901 season while also moving to second base during his time at St. Paul. 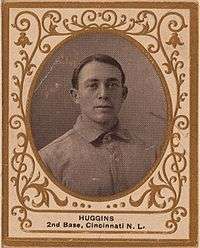 Huggins handled 19 fielding chances, 11 putouts and nine assists, without committing an error in a game with the Saints in 1902; the previous Major League Baseball (MLB) record being 18, set by Fred Dunlap in 1882. In 1903, he pulled off the first delayed steal in recorded baseball history. Fleischmann, part-owner of the Cincinnati Reds of the National League (NL), kept an eye on Huggins while he played for St. Paul. The Reds duly purchased his contract from the Saints before the 1904 season. He made his MLB debut on April 15, 1904, and proved very adept at getting on base. He batted .264 with the Reds that season and improved in the 1906 season, finishing with a .292 batting average and 41 stolen bases, while spending considerable time developing his upper-body strength. Although Huggins hoped to be selected as Ned Hanlon's successor as Cincinnati's manager after the 1907 season, the Reds instead went with John Ganzel. In 1908, He played with the Reds in the Cuban-American Major League Clubs Series. Hampered by a broken ankle and torn ligaments in his shoulder, he slumped to .209 in 1909. Before the 1910 season, the Reds traded Huggins, along with Frank Corridon and Rebel Oakes, to the St. Louis Cardinals in return for Fred Beebe and Alan Storke. He set an MLB record on June 1, 1910 with six plate appearances but no at bats, with four walks and two sacrifice flies. In the same year, he batted .265 for the Cardinals and led the NL in walks. On July 13, 1911, he tied the NL record for successful fielding chances in a game with 16. At the end of the season, he finished sixth in the voting for the Chalmers Award for Most Valuable Player. In 1912, he hit over .300 for the first time in his career. Huggins became player-manager for the Cardinals after the 1912 season, succeeding Roger Bresnahan, with team owner Helene Hathaway Britton preferring his "gentlemanly" manner over Bresnahan's rougher personality. With the acquisition of speed in a trade with the Pittsburgh Pirates, including Dots Miller, Art Butler, Cozy Dolan and Chief Wilson, the Cardinals contended for the NL pennant in 1914. Finishing in third place, it was the Cardinals' best finish since 1876, but they fell back to sixth in 1915 and last in 1916. When Britton sold the team after that season, she offered Huggins a chance to buy a part of the team. While he was attempting to raise money from the Fleischmann family, Britton sold the team to a group headed by Samuel Breadon, who hired Branch Rickey to run the team's day-to-day operations in the front office. Huggins had coached the young Rogers Hornsby, helping him to correct his batting stance, and Hornsby duly succeeded him as the team's starting second baseman in 1917 as Huggins ended his playing career. He managed the team during 1917, the last year of his contract, but was not retained. With the New York Yankees of the American League (AL) not performing well, Yankees owners Jacob Ruppert and Tillinghast L'Hommedieu Huston sought to replace "Wild" Bill Donovan as manager. Ban Johnson, AL president, suggested Huggins to Ruppert as a replacement for Donovan. Huston, who had been in Europe at the time that Ruppert had made the appointment, disliked Huggins and wanted to hire Wilbert Robinson, his drinking buddy. Ruppert himself had been put off by Huggins' wool cap and practice of smoking pipes in public, which he felt was the mark of the working class. However, Ruppert interviewed Huggins upon Johnson's recommendation, and agreed that Huggins knew much about baseball. Ruppert offered the job to Huggins, who initially did not want to take the position, as the Yankees were in no better a position than the Cardinals. J. G. Taylor Spink of The Sporting News eventually convinced Huggins to accept the offer, and he signed a two-year contract. The hiring of Huggins drove a wedge between the two co-owners that culminated in Huston selling his shares of the team to Ruppert in 1922. "I call him the squarest shooter I ever knew in baseball." Having taken charge Huggins did not shy away from making personnel changes. Upon taking over the Yankees, he stressed fundamental baseball, drilling the Yankees in the art of the bunt. Huggins also made his first player transaction, acquiring Del Pratt and Eddie Plank from the St. Louis Browns trading Nick Cullop, Joe Gedeon, Fritz Maisel, Les Nunamaker, Urban Shocker and $15,000 ($236,383 in current dollar terms), a move that led to criticism in the press. In Huggins' first season with the Yankees, the team finished fourth in the AL. After that season, he obtained Ernie Shore, Dutch Leonard and Duffy Lewis from the Boston Red Sox, for Ray Caldwell, Frank Gilhooley, Slim Love, and Roxy Walters. The following year he traded Pratt, Muddy Ruel, Hank Thormahlen and Sammy Vick to the Red Sox for Waite Hoyt, Harry Harper, Mike McNally and Wally Schang. Huggins signed a one-year contract to remain with the Yankees for a reported $12,000. Huston continually took the side of his players in any argument they had against Huggins, criticizing Huggins in the press when the Yankees lost the pennant in 1920. Meanwhile, Ruppert was at best a lukewarm advocate of Huggins. Babe Ruth resisted Huggins' discipline; he did not respect Huggins due to his small stature, soft-spoken nature, and inability to fight, and Huggins was unable to enforce punishments on Ruth. The Yankees finished third in the AL in 1919 and 1920. Huggins signed a one-year contract to remain with the team in 1921. Coming into the 1921 season, Huggins was still experiencing criticism in the press. Hugh Fullerton wrote that "in the past Huggins has not shone as a leader of men". By that season, Huggins developed Aaron Ward, Wally Pipp, and Bob Shawkey. The Yankees won their first AL pennant in 1921, reaching the World Series for the first time in franchise history, silencing his critics in the press. However, they lost the 1921 World Series to the New York Giants. In response, Huggins sought to add more pitching talent. Before the 1922 season, Huggins acquired Johnny Mitchell from the Vernon Tigers of the Pacific Coast League and traded fan favorite Roger Peckinpaugh along with Rip Collins, Bill Piercy, and Jack Quinn to the Red Sox for Everett Scott, Bullet Joe Bush, and Sad Sam Jones. By this time, Ruppert hired Ed Barrow as the team's business manager, and he aided Huggins in player transactions. The Yankees repeated as AL champions that season, but lost the 1922 World Series, again to the Giants. With the newly gained confidence of his owners, Huggins was retained as manager. The Yankees won their first World Series in 1923, preventing the Giants from repeating as champions for the third consecutive season. They were unable to retain their title the following season however, finishing second in the AL to the Washington Senators. Huggins had come to regret his trade of Urban Shocker to the Browns. In St. Louis, the spitballer Shocker had come into his own as a starter, racking up four straight 20-win seasons in the years 1920-23 and leading the American League with 27 wins in 1921 and strikeouts the following year, when he won 24 games. Shocker was reacquired for Bullet Joe Bush, Milt Gaston and Joe Giard in December 1924. However, through 42 games of the 1925 season, the Yankees struggled, falling to seventh place in the eight-team AL, 13 1⁄2 games out of first place. Huggins made wholesale changes to the Yankees' lineup, as he replaced Ward at second base with Howard Shanks, catchers Steve O'Neill and Wally Schang with Benny Bengough, and, most notably, Pipp with Lou Gehrig at first base, beginning Gehrig's record consecutive games played streak. Among the team's regulars, only Babe Ruth, Joe Dugan, and Bob Meusel remained in the lineup. However, the team continued to struggle; amid rumors that he might replace Huggins, Ruppert stated that "Miller Huggins will be manager as long as he cares to be". The Yankees fell to seventh place in the AL that season. With Ruppert's full support, Huggins' duties with the Yankees included keeping Ruth in line. Unafraid of his star player, Huggins and Ruth often clashed. Huggins suspended Ruth indefinitely on August 29, 1925 for "misconduct off the playing field", while also fining him $5,000 ($67,581 in current dollar terms). Ruth responded by claiming Ruppert would rescind the fine and suspension, and that he would never play for Huggins again, believing that Ruppert would side with him over Huggins. However, Ruppert insisted that the fine would stand and that Ruth would be suspended for as long as Huggins desired. After apologizing to Huggins and Ruppert, Ruth was reinstated on September 5. Ruth did not challenge Huggins' authority again. "He was the only man who knew how to keep me in line." Huggins restructured the team for the 1926 season, giving starting jobs to Mark Koenig and Tony Lazzeri. That season, Huggins won his fourth pennant with the Yankees in 1926, marking the first time that a team won a pennant after finishing seventh the year prior. However, the Yankees lost the 1926 World Series to the Cardinals in seven games. Winning the pennant once again in the 1927 season, Huggins matched Cap Anson's mark of five pennants in seven seasons. That year, the Yankees benefited from the development of George Pipgras and Wilcy Moore, and set an American League record with 110 regular season victories, winning the AL by 19 games. The Yankees swept the Pittsburgh Pirates in the 1927 World Series. This team became known as Murderers' Row, and is considered the one of the greatest teams in baseball history. Huggins remained confident in his team's ability to repeat as AL champions in 1928 season. Huggins supplemented his team by acquiring Bill Dickey from the minor leagues. He acquired Stan Coveleski, who was attempting to return to his peak years, but released him in August when the former star continued to struggle. The Yankees reached the 1928 World Series, winning their sixth pennant in eight years, and defeated the Cardinals 4 games to 0. This was the first time a team swept their opponents in consecutive World Series'. Huggins continued to tinker with his roster during the offseason. He traded Dugan, Mike Gazella, Rosy Ryan and Pat Collins, and acquired Lyn Lary from the Pacific Coast League. He tried Lary at third base and Leo Durocher at shortstop, while he attempted to acquire George Uhle and Ed Morris, but was unsuccessful in both cases. The Yankees fell behind the Philadelphia Athletics in the standings during the 1929 season and as it became clear that the Yankees would not win the AL pennant in 1929, Huggins began consulting with coaches Art Fletcher and Bob Shawkey about the future of the team, including how to replace Bob Meusel in left field. However, by August 1929 Huggins began losing weight and complained of feeling ill.
Huggins fell ill on September 20, 1929, and checked into Saint Vincent's Catholic Medical Center for erysipelas. His condition was complicated by the development of influenza with high fever. The Yankees' club physician, in consultation with other doctors, decided to administer blood transfusions. But despite their best efforts, Huggins died at the age of 51 on September 25, 1929 of pyaemia. The American League canceled its games for the following day out of respect, and the viewing of his casket at Yankee Stadium drew thousands of tearful fans. A moment of silence was held for Huggins before the start of Game 4 of the 1929 World Series (at Philadelphia's Shibe Park, after which the A's overcame an 8-0 Cub advantage with 10 runs in the last of the seventh for a spectacular 10-8 come-from-behind victory and a 3-1 Series advantage). He was interred in Spring Grove Cemetery in his native Cincinnati. The Yankees found it difficult to replace Huggins. Art Fletcher managed the team for its final eleven games of the 1929 season, but he did not want to manage the team full-time. After the season, Ruppert offered the job in turn to Fletcher, Donie Bush and Eddie Collins, all of whom declined. Eventually, "Bob the Gob" Shawkey agreed to serve as the Yankees manager for the 1930 season, leading the team to a third-place finish. Huggins was listed at 5 feet 5 inches (1.65 m) and 140 pounds (64 kg). His small stature inspired the nicknames "Mighty Mite" and the "Mite Manager". He was also known as "Rabbit" and "Little Everywhere" for his ability to cover ground in the infield. An excellent leadoff batter and defensive second baseman, he ended his playing career with a .265 batting average and .956 fielding percentage. He led the league in walks four times and regularly posted an on-base percentage near .400. He scored 100 or more runs three times and regularly stole 30 or more bases for 324 lifetime steals. On the downside, in 1914 he set the single season caught-stealing record in the National League, when he was thrown out 36 times (as opposed to 32 successful steals). Huggins finished his managerial career with a 1413–1134 record. His 1413 wins as a manager ranks 23rd all-time (as of the start of the 2012 season). He learned his managerial strategy by observing Hanlon and Bresnahan. His managerial style at first emphasized speed, base-stealing, hit- and-run plays and "slap" (i.e., contact) hitting, but the acquisition of superstar slugger Ruth dictated a change of emphasis towards power and not giving away outs. For the slugging Yankees of the 1920s, he recruited power hitters and consistent (as opposed to brilliant) pitchers. In 1915, umpire and sportswriter Billy Evans, writing about the scarcity of competent second basemen in baseball, listed Huggins, Collins, Pratt, Johnny Evers, and Nap Lajoie as the best in the game. He later wrote that Huggins was "one of the greatest managers I have ever met". Bill James ranked Huggins as the 37th best second baseman of all time in 2001 in his The New Bill James Historical Baseball Abstract. 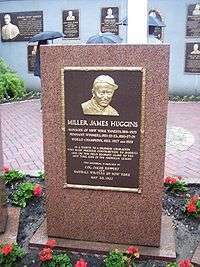 The Yankees dedicated a monument to Huggins on May 30, 1932, placing it in front of the flagpole in center field at Yankee Stadium. Huggins was the first of many Yankees legends granted this honor, which eventually became "Monument Park", dedicated in 1976. The monument calls Huggins "A splendid character who made priceless contributions to baseball." The Yankees also named a field at Al Lang Stadium, their spring training home, after Huggins. Huggins was included on the ballot for the National Baseball Hall of Fame in 1937, 1938, 1939, 1942, 1945, 1946, 1948, and 1950,[a] failing to receive the number of votes required for election on those occasions. The Veterans Committee elected Huggins to the Hall of Fame in February 1964, and he was posthumously inducted that summer. Huggins was a private man who kept to himself. He lived in Cincinnati during the winters while playing for the Reds and Cardinals, but began to make St. Petersburg, Florida his winter home while managing the Yankees. Huggins did not marry, and lived with his sister while in Cincinnati. Huggins invested in real estate holdings in Florida, although he sold them in 1926 (three years before the stock market crash, fortunately for him) as they took too much of his time away from baseball. He enjoyed playing golf and billiards in his spare time. a No elections for the Hall of Fame were held in 1940, 1941, 1943, or 1944. 1 2 3 4 5 Koppett, Leonard. The Man in the Dugout: Baseball's Top Managers and How They Got That Way. Temple University Press. p. 83. ISBN 1-56639-745-6. Retrieved April 17, 2012. 1 2 3 4 5 6 7 8 9 10 11 12 13 14 "Miller Huggins of Cards is Smallest Player in Majors". The Meriden Daily Journal. August 7, 1913. p. 8. Retrieved April 17, 2012. 1 2 3 4 5 6 7 8 Grayson, Harry (June 5, 1943). "Huggins Excelled As Lead-Off Man". The Pittsburgh Press. p. 8. Retrieved April 17, 2012. 1 2 Smelser, Marshall (1993). The Life That Ruth Built: A Biography. University of Nebraska Press. p. 193. ISBN 0-8032-9218-X. Retrieved April 17, 2012. ↑ McDermott, J. R. (October 1913). "Miller Huggins, the Midget Manager" (pdf). Baseball Magazine. Baseball Magazine Co. 11 (6): 63. Retrieved April 18, 2012. 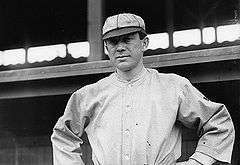 1 2 3 "Miller Huggins Holds a Fielding Record: Yankees' Manager Handled 19 Chances In One Game At Second Base Without An Error In 1902". Reading Eagle. January 10, 1923. Retrieved April 17, 2012. ↑ "Stands No Chance of Being Manager: Miller Huggins". The Pittsburgh Press. December 20, 1907. p. 26. Retrieved April 17, 2012. 1 2 3 "Miller Huggins Has Won Four Pennants". Portsmouth Daily Times. Associated Press. September 28, 1926. Retrieved April 17, 2012. ↑ "Huggins to Manage Cardinals". The New York Times. November 3, 1912. p. S4. Retrieved April 17, 2012. ↑ O'Connor, W. J. (August 22, 1914). "Miller Huggins Wins Recognition As A Great Pilot :Has Made Pennant Factor of Cards. Midget Manager, With a Little Money and Few New Players, Has Built Up Flag Contender". The Pittsburgh Press. p. 7. Retrieved April 17, 2012. ↑ "Yankees' Manager Planning Trades — Miller Huggins Arrives Here and Says He Hopes to Strengthen the Club by Deals". The New York Times. November 29, 1919. Retrieved April 18, 2012. 1 2 3 4 "Miller Huggins' Annual Housecleaning: Castoff List Grows Larger in New Drive". The Miami News. Associated Press. January 4, 1929. p. J-5. Retrieved April 17, 2012. 1 2 "Miller Huggins Talks Of Plans For Converting Yankees Into A Winning Combination — Huggins Is Ready To Mold Yankees New Manager Settles Down To Task Of Winning A Pennant For Local Club. Says He Seeks Outfielder: With Pratt at Second and Another Good Hitter, Leader Thinks Team Can Triumph". The New York Times. February 2, 1918. Retrieved April 18, 2012. 1 2 3 4 Farrell, Henry L. (January 6, 1922). "Miller Huggins Champion Trader of Major League". Berkeley Daily Gazette. United Press International. p. 3. Retrieved April 17, 2012. 1 2 3 4 5 6 7 8 Evans, Billy (August 15, 1927). "Miller Huggins Seeks Young Hurling Stars". The Milwaukee Journal. p. 1. Retrieved April 17, 2012. 1 2 "Huggins Retained To Manage Yanks; Reappointed Under One-Year Contract--Barrow Named as Business Manager. Evers Will Lead Cubs; Trejan is Released by McGraw to Accept Offer from Old Team-- Jennings May Go to Braves. Huggins to Sign To-Day. Barrow Managed Champions. McGraw Gives Evers Release. Jennings Story Denied". The New York Times. October 20, 1920. Retrieved April 21, 2013. 1 2 3 4 5 6 Daley, Arthur (February 4, 1964). "Choice of Yanks' Huggins was Satisfying to Many". The Milwaukee Journal. The New York Times News Service. p. 2. Retrieved April 17, 2012. ↑ "Huggins Has Developed Only Four Members of His Pennant Crew". St. Petersburg Times. January 25, 1922. p. 7. Retrieved April 17, 2012. ↑ "Miller Huggins Seeks Material For Yank Team: World's Series Emphasized Need For First Class Hurlers". The Telegraph-Herald. December 14, 1921. p. 13. Retrieved April 17, 2012. ↑ "O'Doul Not To Be Included In Trade; Yankee Business Manager Denies That Southpaw Is to Be Exchanged for Strunk". The New York Times. February 17, 1922. Retrieved July 9, 2012. ↑ Cummiskey, Thomas L. (October 10, 1922). "Yankee Owner to Retain Miller Huggins". The Telegraph-Herald. Universal Service. p. 11. Retrieved April 17, 2012. 1 2 Freeman, Rick (March 25, 2012). "Setting the record straight on Pipp, Gehrig". The Times of Trenton. NJ.com. Retrieved April 18, 2012. ↑ "Ruppert Denies Miller Huggins to Leave Yanks". St. Petersburg Times. Associated Press. July 25, 1925. p. 7. Retrieved April 17, 2012. ↑ "Ruth Assails Miller Huggins: Suspended Slugger Declares Manager Seeks to Shift Blame From Poor Showing of Team". Gettysburg Times. August 31, 1925. p. 2. Retrieved April 17, 2012. ↑ "Ruppert Sends Ruth Back to Miller Huggins". The Washington Reporter. United Press International. September 1, 1925. p. 1. Retrieved April 17, 2012. ↑ "Reinstate Babe Ruth Saturday, Huggins". Gettysburg Times. September 5, 1925. p. 3. Retrieved April 17, 2012. ↑ "Sports Tabs". Palm Beach Daily News. United Press International. February 6, 1926. Retrieved July 9, 2012. ↑ "Athletics May Equal Total Victories Marks of '27 Yankees and '06 Cubs". Youngstown Vindicator. August 2, 1931. p. C-2. Retrieved April 17, 2012. ↑ "Huggins Thinsks His Yanks Can Win 1928 Flag: But Midget Mentor Refuses to Make Prediction; May Beat Selves". St. Petersburg Times. March 26, 1928. p. 2-1. Retrieved July 6, 2012. ↑ "Miller Huggins Daring Pilot". The Milwaukee Journal. July 28, 1927. p. 1. Retrieved April 17, 2012. ↑ "Huggins Selects The Pirates To Capture Pennant". St. Petersburg Times. March 24, 1928. p. 2-1. Retrieved July 6, 2012. ↑ "Yankees Sign Zachary and Release Covey". Rochester Evening Journal. August 24, 1928. p. 10. Retrieved July 6, 2012. ↑ Moriarty, George (January 12, 1929). "Miller Huggins Refuses to Be Caught Napping". The Milwaukee Journal. p. 2. Retrieved April 17, 2012. 1 2 3 Foster, John B. (October 26, 1929). "Shawkey to Carry Out Miller Huggins' Plans". The Milwaukee Journal. p. 2. Retrieved April 17, 2012. 1 2 3 Kirksey, George (September 26, 1929). "Miller Huggins, New York Yankee Pilot, Succumbs". The Pittsburgh Press. United Press International. p. 32. Retrieved April 17, 2012. ↑ "Miller Huggins, Manager of Yanks, Critically Ill". The Pittsburgh Press. The United Press. September 23, 1929. p. 27. Retrieved April 17, 2012. ↑ "Miller Huggins Still Fighting For Life: Yank Manager Holding Own, Little More". The Miami News. Associated Press. September 24, 1929. p. 11. Retrieved April 17, 2012. 1 2 Kallman, Jeff (March 22, 2012). "Great Players, Great Managers?". Sports Central. Sports-central.org. Retrieved April 18, 2012. ↑ Bell, Brian (October 12, 1929). "Cubs Trying Hard to Tie Up the World Series: Win Over Mack Nine Yesterday Gives New Life". The Miami News. Associated Press. p. 11. Retrieved April 17, 2012. ↑ Wischnowsky, Dave (March 30, 2012). "Wisch: With House-Cleaning Done, Heat Is Now On Illini's Thomas". CBS Chicago. Chicago.cbslocal.com. Retrieved April 17, 2012. ↑ Davis, Ralph (September 26, 1929). "Huggins Not Appreciated: Dead Manager of New York Yankees Was Quiet and Unobtrusive, Keeping Himself Out of the Spotlight". The Pittsburgh Press. p. 32. Retrieved April 17, 2012. ↑ "Caught Stealing Records: Single Season Caught Stealing Records". Baseball Almanac.com. Retrieved 25 July 2012. ↑ "Baseball Managers and Managerial Leaders". Baseball-Reference.com. Retrieved April 18, 2012. ↑ Evans, Billy (December 17, 1928). "Billy Evans Praises Miller Huggins of Yanks". The Miami News. p. D18. Retrieved April 17, 2012. ↑ Walworth, Warren (February 11, 1958). "Young Yankees Report to Rookie Class Today: Miller Huggins Field Is Site of Talent Hunt". St. Petersburg Times. p. 1-C. Retrieved April 17, 2012. ↑ "7 Players Inducted Into Hall of Fame". The Palm Beach Post. Associated Press. July 28, 1964. Retrieved April 17, 2012. ↑ "Arthur Huggins, Miller Huggins' Brother, Dies". St. Petersburg Times. June 26, 1963. p. 9-B. Retrieved April 17, 2012. ↑ "Miller Huggins Has Proven His Faith in St. Petersburg by Buying and Improving Property". St. Petersburg Times. February 24, 1925. p. 4. Retrieved April 17, 2012. ↑ "Miller Huggins Sells Out His Real Estate Holding To Give Yanks Undivided Attention". The Evening Independent. February 18, 1926. Retrieved April 17, 2012. ↑ "Miller Huggins, Yanks Manager, Arrives in City". The Evening Independent. October 31, 1928. p. 1. Retrieved April 17, 2012. Wikimedia Commons has media related to Miller Huggins.